Word Search Printer is an easy-to-use-software program for preparing and printing your own word search puzzles. 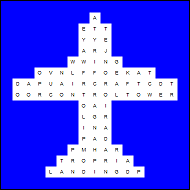 It's ideal for teachers and parents who want to create educational word search puzzles, and can also be used to create a fun or entertainment word puzzle, whenever you want. 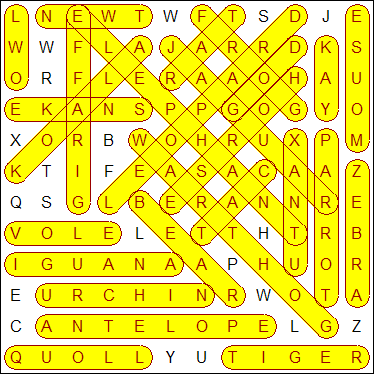 Why Choose Our Word Search Maker Software? Preparing word search puzzles by hand can take hours. 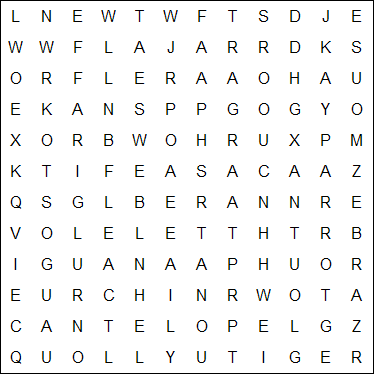 With Word Search Printer, you can do the job in just minutes! Just enter a list of words (or choose one of the pre-made lists, or paste in a list of words from another program), and the puzzle appears in an instant. Don't like the current puzzle? Click "Update Puzzle" and a new puzzle appears in a flash. 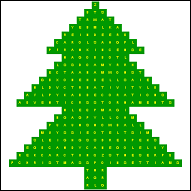 ...But with Word Search Printer you can print off your own puzzle themed around whatever subject you like, and presented however you choose - all using your own printer. And you can do it whenever you want. We are so confident that you are going to love Word Search Printer, that we want you to download and out a Trial version of the software for FREE. The Free Trial version, does have some limitations, but there are no time limits for how long you can use it for - we're confident that you will want and even love this program. When you're convinced that Word Search is the perfect program for you, you can purchase (register) the program from just $21.95* (Sales Tax or VAT may apply - see note below) (family license to use the program on a single computer). * $21.95 price is for a license to use the software on a single computer, for persons who are permanent residents of the same household or who are members of the same immediate family, including for home schooling purposes. The software may used for non-commercial and non-profit purposes only. Different prices apply if you wish to purchase the software for other purposes (starting at $21.95 for educational and non-profit uses, and starting at $39.95 for commercial or for-profit use). These prices do NOT include Sales Tax or Value Added Tax ("VAT"). Sales Tax applies to purchases made by residents of some US states, territories, districts and possessions (including, but not limited to, the residents of the State of New York). Value Added Tax ("VAT") is applicable to purchases made by residents of European Union countries, and (if applicable) is charged at the appropriate national rate for that country. The amount of Sales Tax or VAT (if any), and the total price of the product, is shown on the secure order form, after you select your country/state of residence, but before you give final confirmation that you do want to proceed with the purchase. All online purchases are made from our retailer, Click Sales Inc. ("CLICKBANK").